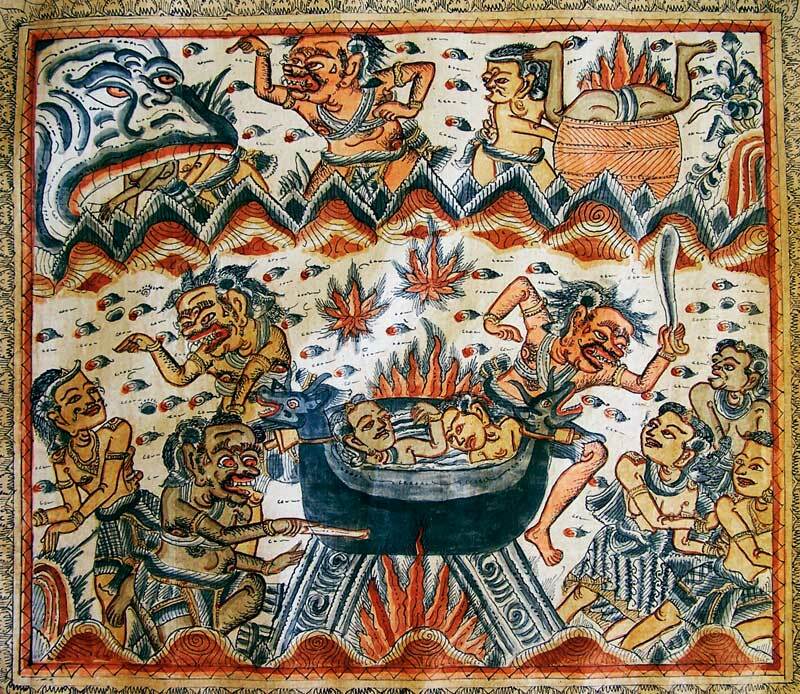 Another painting of Balinese hell that I own. Spiritual teachers say a lot of conflicting things. How do we know what is true? This is such an important question. Leaving the issue of spirituality aside, how do you determine that anything is true? What is the difference between knowledge, belief and faith? These things get mixed up in our minds sometimes, and never more so than when we step outside the purely empirical and into the realm of mystical or spiritual experience. What is faith? Perhaps it is believing a thing without requiring any proof of it. Or believing a thing in spite of not being able to prove or disprove it. What is faith to you and what role does it play in how you determine what is true? I’m trying to come up with something in which I have implicit faith. I can’t think of anything at the moment. What leads you to believe a thing? How easy is it for you to update your beliefs, once they are formed? What is the value of having beliefs? What’s the difference between believing a thing and knowing a thing? What is the basis of knowing? Is it direct experience? Let’s take something totally mundane as an example. I believe the sun will rise tomorrow morning. It has risen every morning since the first morning I can recall, and everyone else seems to share this experience, so I feel confident arranging my life in such a way that when I go to sleep at night, I believe the sun will rise the next morning. It’s not based on faith, because there is a lot of evidence to suggest it will. And I don’t know it will for certain, because the sun could blow up sometime while I’m asleep. How about something a little more challenging. Let’s say you were abandoned by your mother at birth. She gave you up for adoption. Your adoptive parents told you she was a prostitute and wanted nothing to do with you, that she was a drug addict and left you on the steps of a church. Every time you got sick as a child, they would bring up that it was likely due to the fact that your mother was taking drugs while pregnant, or that you were malnourished or neglected prior to being adopted. You develop skin rashes in grade school or asthma, and it’s all put down as a result of how badly you were neglected as an infant. You develop a complex. You believe that you are sickly because of this early deprivation. You nurture feelings of abandonment, a deep sadness, separation anxiety, rage or some other issues, based on your belief in being abandoned and neglected by your own birth mother. You have problems with self esteem, problems in relationships, you go to years of psycho therapy, read self help books, join support groups. In reality, your “adoptive” parents actually kidnapped you as a baby from your very loving parents. Your parents are bereft and have never stopped looking for you, thinking about you, hoping someday by some miracle to find you. Let’s move on to something more direct and experiential. You are driving on the freeway and suddenly you see Jesus sitting in the passenger seat. He tells you to change lanes now. He even reaches over in the split second that you are motionless, stunned, and grabs the wheel and starts the process for you. You change lanes just in time to avoid a truck swerving out of nowhere, which would have killed you for certain had Jesus not intervened. If you were not a Christian, you might convert on the spot. If you were a Christian, this might be taken on face value, that Jesus actually appeared and intervened to save your life, though he didn’t seem much concerned with the lives of the other people who were hurt or died in the wreck. Or you might think you were psychotic, and seek medical help. Or you might believe it was your subconscious projecting an image of Jesus in order to protect you from the accident, which was registered by the subconscious mind before it could be registered by the much slower conscious mind. There is also the vast reservoir of received knowledge and received wisdom. You believe the earth orbits the sun, but how many of you have actually made the observations and calculations to verify this for yourselves? It’s absolutely mind blowing to acknowledge how much we don’t know for certain about our minute by minute experience. We perceive something with our senses, which is subjective to begin with, then we set about interpreting it. How close to the “truth” do we ever get? If twenty people witness the same event, how many of them give the same account of it? Life becomes impossible without working theories. Having frameworks for how things work or how our experiences fit into some larger picture help us to get on with business of living. The problem is when people absolutely believe these theories, these frameworks. The frameworks are there as tools, they are not the truth. You can modify them with new information, flesh them out if it’s fun to do so, discard them when they no longer serve you. You can go very deeply into a certain framework, really play with it, but once you take it seriously, start believing that it’s the truth, it ceases to be a tool that serves you…you bind yourself in service to the belief. We all take on frameworks, but please keep them light and be the master, be the artist. If someone shares one of their frameworks with you, try it on if you like, use it if you like, but don’t take it seriously. And it’s okay to admit you don’t know something. In fact, I am more often in this state of not knowing than anything else. People ask me how being inedic or breatharian works. They are expecting me to tell them the body shifts to taking energy from the sun for nourishment, or from “Source”. The more intelligent you are, and by that I mean the old fashioned high IQ kind of intelligence, the more likely you are to come up with a very plausible sounding answer. That answer may get so detailed and fleshed out that you write a whole book about it and become an expert. People repeat what you say all over the internet and the next thing you know, it’s received wisdom. Seriously, it’s okay to just say you don’t know. This is not about being skeptical, though I think healthy skepticism is a good thing. It’s about acknowledging on a fundamental level that we barely know what we see with our own eyes, and once we run it through our interpretation programs, who knows how close to any truth the result is. When we receive information from others, whether they are scientists, spiritual teachers or “sacred” texts, we can keep in mind this fundamental quirk, that life is not knowable by the mind in a concrete way. As an experiment, observe how many “blanks” you feel compelled to fill in on a daily basis, and see what happens when you leave them blank and allow yourself not to know. The other issue is inconsistency. It’s very appealing when a spiritual teacher is consistent and never contradicts themselves. It’s easiest to do that if you have a simple shtick. Being a non-dualist is great for this because there is almost no question you can’t field by repeating, “who is asking the question?” I’m not knocking it, by the way. It’s a perfectly valid approach. I’m just saying it’s pretty easy to never contradict yourself with this brand. Two people asking me the same question will get different answers. Not slightly different…the answers may seem mutually exclusive. Why? Because people are asking from different levels and with different needs. To one person I might say that the rebirth of the heart comes after you lose everything, including faith. Faith might be the very last thing this person is clinging to. To another person I might encourage them to have faith in life, because they are coming from a totally different level and they need this encouragement and comfort in order to get through their current ordeal in a healthier way. For this person, losing “faith” right now might be very destructive, whereas for the other it is that last step in the darkness, to go naked even without this small comfort, that will move them out of their Dark Night. I had a difficult time writing this blog because I’m very aware that most of what I say is meant for a certain individual or individuals who are at a similar level and experiencing a similar thing. People ask me questions and I answer them specifically. I can only hope that others who need to hear the same answer will be attracted to the article. It’s not easy for me to speak in generalities in order to address no one in particular. Pretty much all of my writing here is in response to a specific person. So back to the original premise. Why should you believe me? There is no need to believe me at all. You can let my words roll around in your head and if they find a home there for a while, then fine. If not, it’s okay. I don’t have a solid world view, so I can’t offer you one. I can report my experiences and observations as faithfully as possible, and leave you to do the hard work. I don’t actively seek out spiritual teachings anymore, so I don’t find myself in the position of having to evaluate their validity. However, if I were I would check in to see how the teachings felt…do they sit well? Do they resonate? This doesn’t mean they are true, because different things will feel right depending on what level you are at. What clicks for an eight year old is not going to be the same when she’s 30. It doesn’t mean that what clicked for her at eight is less valid. This can be dangerous business, of course. If you have some particularly sticky unresolved issues, you might really click with an abusive cult leader. Or you might read The Secret and that might feel so right to you, and it quickly becomes your everything. As you can see, it’s about you and your level, not so much about what is true or untrue about a certain teaching. I would love to have the power to dissuade people from opening themselves to abuse or disillusionment from spiritual or new age teachers, but that’s not in my gift. The worst thing though is when people finally come out of the experience and only focus on how false or reprobate the teacher or teachings were, without illuminating what it was in themselves that made it not only possible, but attractive. It’s not about finding fault with yourself, but about becoming aware of your own makeup. In the light, you can see what needs to be updated, purged or healed so that you don’t need to repeat the experience in some other way. Of course, not all of us get hurt in our spiritual quest or fall prey to false gurus. It probably isn’t too traumatic to be a Lutheran or a native Buddhist. There are times in our lives when we are open to investigating a certain kind of experience and world view. Even the most sublime of these will eventually be grown out of, or through. And some are not sublime at all. At that moment, when you are about to go down that path with a spiritual teaching of dubious merit, what would happen if someone said, “Nah, you don’t want to do that. Here is a better path.” And then they offered you some sublime pearl of wisdom. You are only ready to receive what you are ready to receive. I know, that’s obvious, isn’t it? It’s tempting to believe that if the one true path was offered along with lesser paths, that we’d chose it instead of the funky detour. What Would the World be Like if Everyone Was Enlightened? Why Am I Still Not Enlightened?